So this morning, I pressed ‘Send’ and the last chapter of the new book went winging its way to my editor in New York. There was a brief glow of accomplishment. A full-body glow, all shiny and radiant. “Finished!” I thought, even as I knew this was untrue. Books are never really finished. There’s a final edit to be done, and then copy-editing, and then the dreaded “author’s questionnaire” will arrive from the marketing department, and as on just about any questionnaire I’ve ever encountered, I just won’t fit. Among other things, it’ll ask me (in slightly different language) to “please describe in 200 words what just took you a whole book to say.” I’ll agonize over these 200 words, and never manage to get them right. And then I’ll wait, heart in mouth, for the pre-publication reviews, which will determine whether ‘Agnostic: a Spirited Manifesto’ — yes, that’s the working title — will thrive in the big wide world. And then for the post-publication reviews, in early 2016, which will determine if it survives at all. Glad you’re back. And looking forward to that new book. AGNOSTIC is such an obscure and bombastic term. On the other hand, infidel sounds so crude and impolite. Is there a more moderate description of somebody who believes and yet not blindly believing, or believing with a pinch of salt.? Obscure and bombastic? Infidel? Salty belief? Good for you Lesley!! I look forward to reading it. I may have a book party in Seattle in July for the book I’ve co-written with a friend: Wise Aging: living with Joy, Resilience and Spirit. Joy, resilience, and spirit — Yes! Do let me know when and where and I’ll be there, Rachel. And be sure to leave time for a drink here too! A huge welcome to your own space, and a greatly revered one for us. This brings in a sense of excited ‘déjà vu’ as we shared your sentiments even at the pre-release phase of The First Muslim. If I can rightly predict through the title, this book will hopefully give us a deep insight into the minds of the agnostic way of thought. This has always been an intriguing subject to me, esp. after being introduced to your blogs and books. Haven’t met any in person as yet. Meanwhile, looking fwd to your regular dose of intellectual stimulation…write on! You got it, Nuzhat! Not ‘agnosticism’ — the last thing we need is more ‘isms’ — but new dimensions opened up by the agnostic stance. Welcome back – I just finished The First Muslem and am urging all to read it. Congratulations! Looking forward to your latest book. I hope you can relax a bit now. Welcome back! Can’t wait to read both your blogs and your book. I’m sure it will all be spectacular, just as your past work has been. Enjoy the book birthing process! Spectacular would be… spectacular! Thanks, Elle. Yes — I kind of wish it was 2016 already so’s I could hold it my hands. 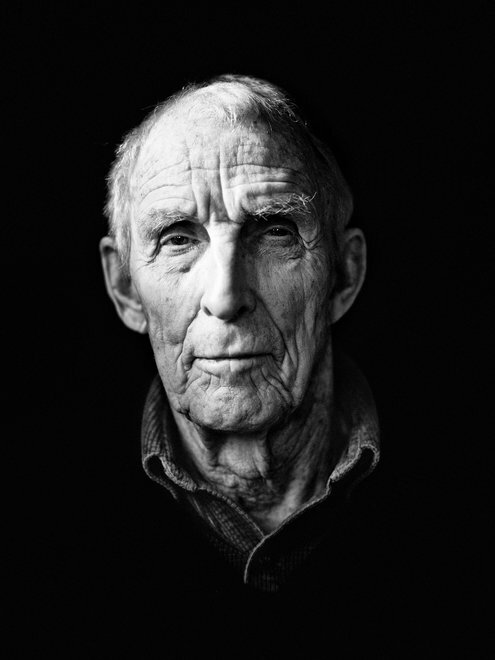 My copy of Peter Matthiessen’s The Snow Leopard bears the marks of a well-used life, much like the photo of him in today’s New York Times. The cover is torn and tattered, the linen boards worn and faded, the pages yellowing at the edges. The end pages are full of scribbled notes to myself, the text scored and marked in the margins. This is a much-read book. I’ve placed it high on the reading list of every writing course I’ve ever taught, tracing the intertwining of its parallel journeys: on the one hand, into the hidden inner sanctum of Dolpo on the Tibetan plateau, in search of the elusive snow leopard; on the other, into the mystical and equally elusive peacefulness of Zen Buddhism. There were far more than two hands, of course, which is why I read the book so many times and never tired of it, entranced by the intense lyricism of its descriptions of landscape, and the sharp contrast with the pared-down writing about Zen practice. I have most of Matthiessen’s other books too, both fiction and nonfiction, but this is the one I keep coming back to (in a way I suspect would have deeply disappointed him — no writer cares to be defined by one book above all the others). I didn’t know much ‘about’ him other than what he revealed in his writing, which was carefully calibrated. I had no idea he worked a naively youthful two years for the CIA, for example, using the Paris Review as a cover, though I did know he’d become a Zen priest, that he was fiercely involved with environmental issues, and that he was… well, not exactly good-husband material. No matter: the writer was more important to me than the man. Yet much as I love and admire his writing, I haven’t ordered my own copy of his last book, a novel called In Paradise. Instead, it’s waiting for me at the library as I write. And has been waiting a few days. I delay picking it up because even though it’s Matthiessen, something in me doesn’t want to read it. It’s set at a meditation retreat at the concentration camps of Birkenau and Auschwitz, and the very idea of such a retreat seems, at least to me, a horribly ironic oxymoron. Which may indeed turn out to be his point. I’ll find out soon enough. What is this if not pure Zen? We find what we are searching for when we gain the realization that is has always been right before us. Right here. Right now. Bows. His time ended like many others and ours still ticking. Most valuable thing we have in this life is “time”. I feel restless after every sun set. There is a lot to be done to reach my full potential to perfect my moral character, act like a prophet Mohammad, talk like him, walk like him. We came from Allah and we will all return to Him. I am the person who complimented you on the lovely book : The First Muslim. The more I read you, the more I am convinced that you are such a deep believer – in such a deep manner – and such excellent wife material for somebody who can see this ! My “wife” moved on with her two dictionaries I. I shall still study the meaning of : agnostic, but I know DEPTH when I “see” it. “To read books” list updated. Thank you. All of which is by way of saying that I think I’m going to have to take a break from posting here on the AT for a while — a few months, probably — and really focus in on getting a full draft written. Because though I know some people are capable of stunning amounts of multi-tasking, I also know I’m not one of those people. I need to become what any writer mid-book really is: the most boring person in the world, totally mono-focused, all but unaware of everything else that’s happening. The problem is that writing this blog is a wonderful and (to me, at least) surprising exception to that opening statement that writing is hard. I find blogging a delight, and somehow even when I write out of anger, it’s still fun. And your responses and comments are part of the delight and the fun, as well as enormously encouraging. It really does feel like an ongoing conversation, and one I will badly miss. So not-blogging (unblogging?) is going to be hard. Which of course means that if I can’t resist, I may still post something from time to time. Just not with any regularity. Not until I have a full readable draft of The First Muslim (yes, that’s still the title). There’s an upside, though: not only will the book get written sooner, but when I come back to regular blogging (like three times a week), it’ll be with a huge amount of pent-up energy and appetite for the fray. So this is absolutely not a farewell — not least because I’ve only just begun to touch on all the things I wanted to explore when I began the AT fifteen months ago — but just a temporary au revoir. May the muse walk with you daily. I will miss your blogs, but thanks for letting us know that you have set your “writer at work” sign out. I highly recommend Susan Shaughnessy’s “Walking on Alligators,” even though I am guessing you rarely need those daily bits. I found my copy at Henry’s Fremont Place Books, but sadly he no longer there has his shop…. sigh. Yes, I feel the same way about Fremont Place Books — it’s left a hole in my local universe. Best of luck finishing the book. I too will be sad to see you disappear from the ‘blogosphere’ for a while! Best wishes for your book. I’ve never written one so I can’t say I know how it feels, but best wishes all the same! It feels — it always feels — like I’ve never written a book before. I know I have — several, in fact — but somehow that never helps. Your best wishes do. Thanks. Salam. Wish you all the best in your new book titled The First Muslim. Suggest to consider an addition into the present title ie The First & The Muslim . Obviously subject to if it coincides with the contents of your book. Thanks Muzaffar — I’m aware of the tradition that Abraham was the first Muslim, but since Muhammad is told three times in the Quran to say that he is the first one, and since it instantly identifies him for non-Muslim readers, I’m sticking with it unless a brilliant alternative comes to me. — L.
And yes, there will be a sub-title, though haven’t formulated it yet. the anticipation of your most awaited work has made your ‘unblogging’ a bit bearable. infact i would love to read the unpruned version of the book, as i devour every word of your authentic research. your description of the events, conjures a kaleidoscope of history in motion, and draws me deeper into the vortex of my religion. while you take a break with writing, i can take a break with ramzan, hoping to find your book waiting for me thereafter….. Thanks Nuzhat, though I fear I’ll never be able to live up to so much expectation! — L.
Good luck with your book. i am eagerly waiting for it(love the title by the way). I have been trying to get hold of “after the prophet” but cant seem to find it in the biggest of book stores here. Unfortunately amazon and the likes don’t deliver in Pakistan. Apparently those guys don’t trust us with books. Yup — dangerous things, books. Aaaargh. How infuriating. So I finally got my hands on “After the Prophet” and finished it moments ago. I thoroughly enjoyed it and really would like to thank you for all the hard work. The anticipation for your new book has now doubled (no pressure). I wrote a few humble lines on goodreads about the book and I am just going to copy it here. Cheers. “I always feel uncertain when reading history books specially Islamic history where there are so many contrasting versions of the events that defined pretty much who we are today. Lesley has taken a very sensitive topic, has considered both sides of the story to narrate and connected it very shrewdly to the modern day. It was a really interesting read for me personally because this was coming from a outsider looking into some of the darkest times of our history which we are not very comfortable talking about. Although I was familiar with almost all the major events that led to the divide, I found myself chuckling at the spectacle; the big names being stripped of all the holiness and reverence and being presented as just silly little mortals with doubts, failures, weakness and everything human. I imagine if I was not so emotionally invested in subject of the book I would have grabbed some popcorns and a soda while reading it. The whole thing at times is so twisted and interesting that it almost feels like something out of a tragic Shakespearean play. Thanks so much for your appreciation, Meezan. Yes, I chose the word “epic” in the subtitle because it was the right one. An amazing story, precisely because so human. Re your anticipation of ‘The First Muslim’: just finished the final manuscript. Am coming up for air, and will start blogging again in a few days. Found out yesterday that publication date here in the US is January. Suddenly, that seems like next week! I love the way you delivered the (sad) news, and the idea that your check-ins on the blog from time-to-time are like postcards. You will be missed, but we’ll all look forward to being able to share in what you end up creating in the meantime! Thanks Nancy! Just hope they won’t be postcards from the edge… — L.
The honor is mutual, Lamiaa — Thanks! — L.
Just a thought regarding the title. 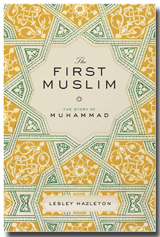 Perhaps calling the book “The First Muslim” may not be appropriate and could be offensive to some Muslims if not most. Muslims consider Adam to be the first Muslim (first prophet and first human to submit to God’s will). Perhaps, “Muhammad, The Last Prophet”. Hope that helps, and good luck with the book, I look forward to reading it. Thanks, Tom — and see earlier reply to Muzaffar. Since the book is written primarily for non-Muslims, and since there are already dozens of books titled ‘Muhammad,’ I think I need something that speaks more invitingly to my primary audience. While some Muslim traditions have since said that Abraham was the first Muslim, and others Adam, the Quran does say it is Muhammad, repeatedly (three times as opposed to once, far less directly, for Abraham). Of course I’ll discuss the issue in the book itself. Hi Lesley, Good luck with the book. Can’t wait to see it published. I am wondering if you have a muslim “guide” who can clarify contradictory issues that might arise. For example, the issue you mentioned above was thoroughly discussed among muslim clerks before and an explanation was given.. Thank you. This is obviously not an “authorized” biography, so good Muslim friends trust that I will find my own way. Just as obviously, I make no claim to speak for Islam, just as I made no claim in previous books to speak for Christianity or for Judaism. My approach is historical, not theological. To repeat what I just replied to a commenter on another post: I don’t subscribe to the idea of a single truth, let alone whole truth or absolute truth. One tries for truth in the very human acknowledgment that is always debatable. I try to come as close to historical fact as I can, using the earliest sources and deep context in the form of cultural, political, economic, and comparative religious studies. Muhammad was the first Muslim in his era it is true with the new scripture he was given being the first to accept it but all messengers who came before him from Adam, Noah, Abraham, Solomon, Moses and Jesus are described as muslims in the quran which is an adjective describing a state of surrender to the will of God and at the same time connecting their faith in the One God and his massage to humanity throughout time. Because of course I’m behind on my blog reading I’m just now seeing this. So I wish you good luck and bon voyage and as I’m anxiously awaiting the outcome, I can really only say: Hurry up already! Catch the apples! Really looking forward to your book Lesley, I’ve really come to love your style during the past few months, best of luck charging the mountain! Thank you — am a third of the way up the mountain! — L.
I just found your weblog a few weeks ago, and I think I’m so unlucky that you’re not going to write for a while! Anyway, good luck with your writing and I’m eagerly looking forward to read your book about the biography of Mohammad. Thanks Elaheh — I’m looking forward to being able to read it too! Hope you are doing fine with your book?I am reading your book ‘After the Prophet’ salaat o salaam.and I want your attention about some details about the burial of Prophet Muhammad salaat o salaam. I did a research paper on the death of Prophet Muhammad Salaat o salaam. I wish to add that the details of His salaat o salaam are not the whole truth, the main source of Prophet Muhammad salaat o salaam’s life are the books of Hadith. Kindly check these references because in these books their is diffrent account about burial. For the life of Prophet Muhammad salaat o salaam only history books are not enough as Hadith books has more authentic and detail about His life. As you’ll see if you read more of this blog, I don’t subscribe to the idea of a single truth, let alone whole truth or absolute truth. One tries for truth in the very human acknowledgment that is always debatable. I try to come as close to historical fact as I can, using the earliest sources and deep context in the form of cultural, political, economic, and comparative religious studies. i am not judging you or your work here or any time.writing a book is a creation and very hard work. as a matter of fact i watched your ted video about reading Quran and really like it and in your book After the Prophet (salaat o salaam) i cried on the account of death of Ali. very humbly and with due respect i just want to state that history can be made in drawing rooms today and in past. as you mention in your book how Hadiths were collected so in my opinion for the life of Prophet Muhammad (salaat o salaam) hadiths books are more reliable. if you like i will send you those refrences about the burial in hadiths books. No insult taken, Saima. I appreciate your intent, but right now, mid-book, is not the time to explain myself or my research. You might just have to trust me that I get at least something right… Ramadan mubarak — L.
Good for me coz as the month of ramadan has it’s own different activities from rest of the year so this thing is also taking up my time. I will wait till you ll have time. Lesley .. do you have an active facebook page? Hi Lesley, we have been waiting quite long for your new book. And I am not able to get updates anywhere. Would you be kind enough to give us idea on when it would be out. Updates at your service, Mirza! Publication date is January 24. This will be available on kindle, right? I don’t see any kindle link. Am sure it will be. Patience…! Thanks Lesley. And God bless you. With this—you make the day not only bearable but full of delight. Huge thanks.